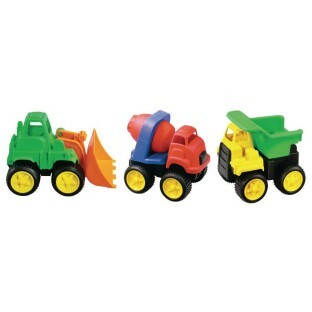 Create your own construction site with colorful, chunky and durable plastic play trucks. Set includes dump truck, cement mixer and bulldozer. Each measures 4-1/2"H x 5-3/4"W x 3-3/4"D.
Create your own construction site with colorful, chunky and durable plastic play trucks. Set includes dump truck, cement mixer and bulldozer. Each measures 4-1/2"H x 5-3/4"W x 3-3/4"D. For ages 18 months and up.